Property Marking Community Event in Cavan with Brendan Smith, T.D., Senator Joe O'Reilly, John Paul Feeley, Chair Cavan JPC, Assistant Garda Commissioner Barry O'Brien, Chief Superintendent John O'Reilly, Sergeant Ken Coughlan, Barry Carey, IFA Crime Preventation Executive, Tommy Ryan, Chief Executive Cavan County COuncil, Vanessa Clarke, Development Officer MnT, Gráinne Boyle, JPC Administrator and James O'Neill, Development Manager, Property Marking Ireland. Property theft is one of the biggest security challenges in Ireland today. Every year within every community in Ireland households and small businesses experience the trauma of being a victim of theft or burglaries. In addition, every year hundreds of thousands of pounds worth of stolen property is recovered from the hands of criminals, but all too often there is no way of identifying its rightful owners. Property Marking Ireland has a solution! This involves a community led crime prevention program run in partnership with the county-based Joint Policing Committees, Local Authorities and community organisations, particularly Community Alert and Neighbourhood Watch groups. This approach has already been tested in a number of counties in Ireland and in the UK and has been found to be very successful. It has been found that the higher the percentage of households and businesses in the community that participate, the more effective the programme is. The program involves marking property with the owner’s Eircode number, which is a unique identifier. and displaying a sticker on the premises to show that household’s or businesses participation in the program. The mark that is made on the property is a physical mark which is etched into the property. It is very difficult to remove and can be repeated a number of times on the one item. The mark is made by a specially-designed machine which embosses the property item with small dots in the pattern of your Eircode. Property Marking Ireland has a solution! This involves a community led crime prevention program run in partnership with the county-based Joint Policing Committees, Local Authorities, JPCs and community organisations, particularly Community Alert and Neighbourhood Watch groups. This approach has already been tested in a number of counties in Ireland and in the UK and has been found to be very successful. It has been found that the higher the percentage of households and businesses in the community that participate, the more effective the programme is. 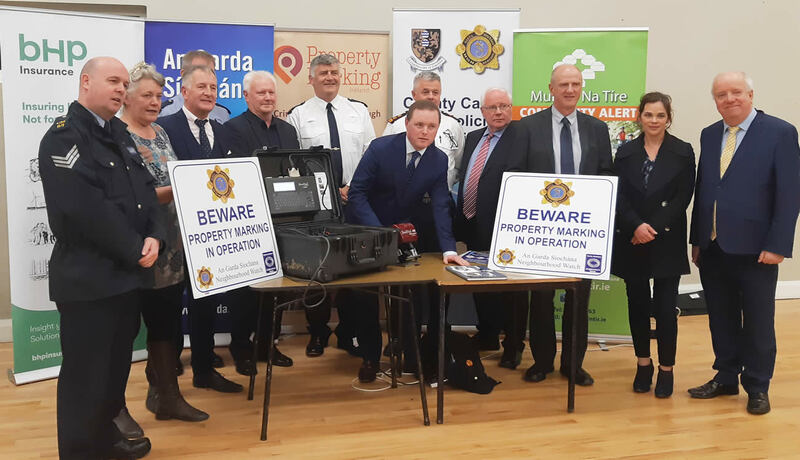 Property Marking Ireland is a newly-established company which has been set up to roll out a property marking crime prevention program throughout Ireland in collaboration with the communities North and South. Property Marking Ireland is a not-for-profit social enterprise with no shareholders. All funds raised will be used for the provision of the service and any profit made will be used to improve or expand this service. The machines which are used by Property Marking Ireland are called dot peen marking machines and are manufactured and distributed by the UK-based Telesis Company. Property Marking Ireland are their sole supplier in Ireland and are the providers of the training that is mandatory for the use of the machines.